While one-on-one battles are commonplace in many fighting games, it’s not really something you see go down in Skullgirls all that often. But the Combo Breaker grand finals last weekend featured Dominique “Sonic Fox” McLean and Jeremiah “WingZero” Beaty, two of the community’s best competitors, using just one character apiece. Both players left a path of destruction behind them as they journeyed to the championship match with their unconventional playstyles. Indie darling Skullgirls is a love letter to the fighting game genre. Rife with in-jokes and familiar gameplay mechanics, the title spread across the globe shortly after it launched in 2012, and the competitive community that sprung up around it has continued to support events that show them favor. Combo Breaker, typically a hotbed for Skullgirls competition, drew in 150 participants this year alone, making it one of the largest tournament’s the game has seen since release. Skullgirls is unique in that players are allowed to choose the size of their team depending on how they like to play. While it’s possible to stick with a single character, players usually select two or three. Sure, playing with one character gives them decent health and damage boosts, but solo fighters miss out on the Marvel-esque assists that greatly expand the repertoire of tricks for pairs and trios. In case you haven’t noticed by now, this past weekend’s Combo Breaker fighting game tournament was a pretty big deal. Where a number of events are starting to focus on just one game (typically Street Fighter V), the Midwest’s crown jewel embodied its “no coasts, no kings” mantra by inviting as many sub-sections of the fighting game community to the Mega Center in St. Charles, Illinois as possible for a raucous weekend of competition. Skullgirls was counted among their number, and as the grand finals approached, it became increasingly clear that Sonic Fox and WingZero would be the last players standing. Sonic Fox is a known quantity. As the world’s leading NetherRealm Studios competitor, he’s made his mark on a number of Injustice and Mortal Kombat tournaments. Far from a one-hit wonder, however, Sonic Fox is also a competent Skullgirls player, frequently placing first and second at important events since 2014. WingZero, on the other hand, is lesser-known in the wider community—not for any lack of skill, mind you, but because he sticks with more niche releases. And while his Skullgirls career hasn’t been quite as impressive as Sonic Fox’s, he’s also considered one of the scene’s more prominent competitors. Their paths through the Skullgirls event were also a little different; where Sonic Fox selected both solo characters and teams from match to match, WingZero stuck with just one fighter throughout the entire tournament. When they finally met in winners finals, WingZero showed no hesitation in selecting solo Filia, a teenage girl infected with a demonic hair parasite named Samson that acts as her main means of offense, despite his past with full teams. In an effort to mitigate the higher damage single characters can dish out on teams, Sonic Fox chose to play with just one character as well. 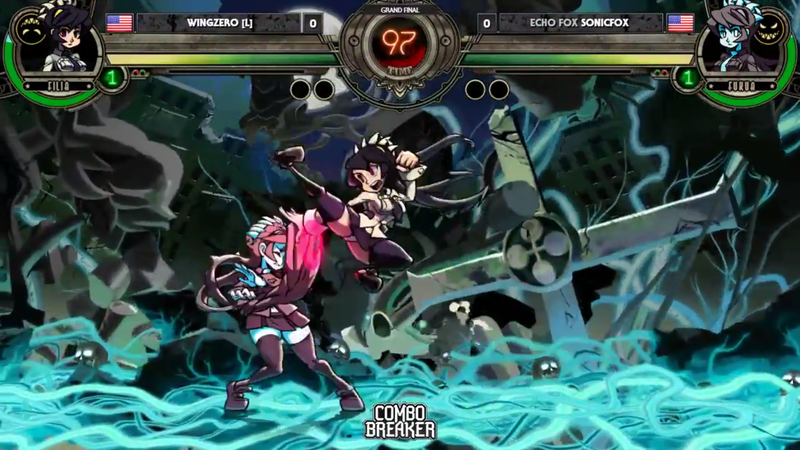 His selection, Fukua, was introduced to Skullgirls in May 2014 as a remix of sorts that looks like Filia but offers additional zoning and grappling capabilities. In the battle of the solo characters, Sonic Fox came out on top, both in winners and grand finals. His ability to deftly switch between Fukua’s disparate playstyles gave him a ferocity that WindZero found hard to counter. There were brief flashes of brilliance, like when his Filia was able to string together a series of hard-to-block resets and crossups but, for the most part, WindZero was at Sonic Fox’s mercy throughout both of their matches. Skullgirls is in an odd place. As a sort of spiritual successor to the gameplay of Marvel vs. Capcom 2 and developed by beloved competitor Mike Zaimont, it receives a lot of lip service that doesn’t necessarily translate to tournament showings. Despite the presence of a dedicated community, Skullgirls has never officially been part of an Evolution Championship Series lineup, forcing its competitive scene to look elsewhere. Fortunately, a handful of events have been able to fill that gap, providing Skullgirls with yearly tournaments that they can look forward to for high-level play. Since launching in 2015, Combo Breaker has become something of a Skullgirls championship, providing a glimpse at how the game has developed and where its community is heading. And while Sonic Fox has won every Skullgirls tournament there thus far, his opponents have been as varied as his skillset. This year, WingZero was able to showcase the power of solo characters in a way few of his contemporaries have before, and his second-place finish with just Filia at his side could act as another important stepping stone for an independent title surviving on the strength of its fanbase.